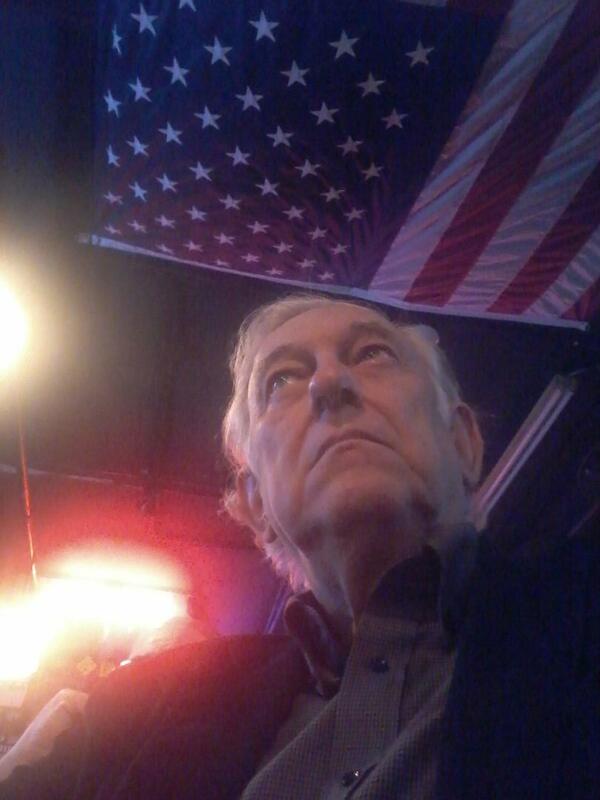 A Disgruntled Republican in Nashville: Obamacare is failing and a tax penalty will not make it work. Obamacare is failing and a tax penalty will not make it work. Obamacare is failing. The sooner it fails and we can start serious discussions about market oriented health care reform the better. Starting in 2016, every American must be enrolled in an Obamacare ACA-compliant health insurance plan or face a tax penalty of $695 per adult or 2.5% of their income, whichever is higher. That is not going to work to change behavior among most low-income people. Among people who are middle-class or socially and culturally middle-class it may, but it is not going to force many low income people to buy health insurance. Most of my working career, I have worked with low income people. Many have expensive cell phone and cable TV and routinely buy lottery tickets, but have no savings. They do not even have auto insurance and that is the law. They pay 540% interest rates or higher at a payday lender company in order to keep their electricity from being cut off and then do the same thing again the following month. For people with this mindset, even if they enroll in health care, will not pay the monthly premium. They would rather spend the $96 a month that their insurance premium cost them, or whatever it is, on a Titans starter jacket or chrome wheels for their muscle car or more bling or attend a concert rather than pay a health insurance premium. The tax penalty is not going to change their behavior. They simply do not understand how income tax works. They think when they get a big income tax refund that Santa Clause just came a little late or that they hit the jackpot. When I explain to them that if they get a tax refund they have been robbed and it is a bad thing, they look at me as if I am crazy. I tell them that when they get a tax refund, the government took too much of their money each week and then gave it back to them, but didn't pay them interest. They don't grasp the concept. In fact, many purposely claim fewer dependents than they actually have to on their w-4 because they know that claiming fewer dependents means a bigger refund at the end of the year. They are not going to pay a health insurance premium in order to avoid a tax penalty. There is a gap between grasping cause and effect. People who spend every dollar they make and do not value savings or grasp the concept of budgeting or delayed gratification will not be able to pay the deductible or the co-pay under Obamacare. They will still go without routine health care and will still go to the emergency room in an emergency. The fear of bankruptcy is not a motivating factor that will persuade many low-income people to get health insurance. Multiple bankruptcy is just the way the world works for many low-income people. They don't even buy cars the way middle class people do. They go to a "buy-here, pay-here" auto dealer and when the transmission starts slipping they stop making the payments and let it get repossessed. I have had them say with pride, "The transmission started slipping and I just told them, they could come and get it." A auto repo or a bankruptcy is not a terrible thing to happen in the minds of many low-income people. Health insurance will not be a high priority with people with this mind set. I am not sure what the solution is. If people do not value health insurance, why should it be forced on them? I know many middle class people who had preexisting conditions and could not get affordable insurance prior to Obamacare value what is offered, but for many others they do not. If emergency care is reduced or community clinics are closed or if hospitals close as a result of Obamacare, many of the low-income who have low-income values and who rely on these services will be worse off. We may need a minimal safety net for the low-income with low-income values and market solutions everyone else. By ROBERT PEAR, The New York Times, WASHINGTON — Obama administration officials, urging people to sign up for health insurance under the Affordable Care Act, have trumpeted the low premiums available on the law’s new marketplaces. USA Today - The nation's largest health insurer warned Thursday that it may pull out of the Obamacare exchanges after 2016 – forcing more than a half million people to find other coverage – after low enrollment and high usage cost the company millions of dollars. Gallup, WASHINGTON, D.C. -- Fifty-three percent of Americans rate the quality of healthcare in the U.S. as "excellent" or "good." 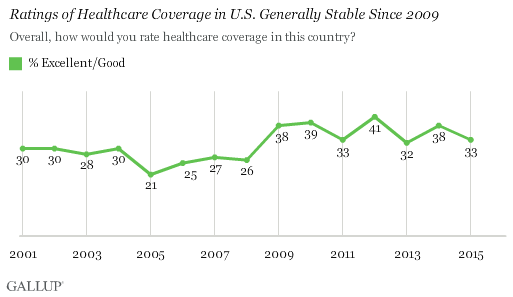 This is similar to what Gallup has found since 2013, but is down from the more positive ratings of 2008 to 2012. 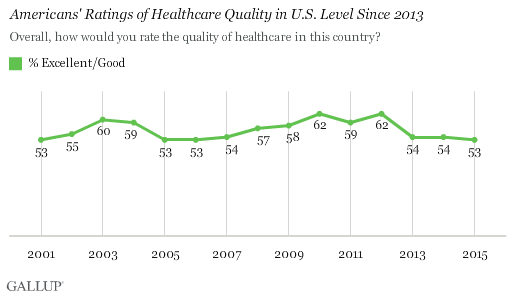 From 2005 to 2007, a slim majority of Americans rated the quality of healthcare in the U.S. as excellent or good. But this percentage increased slightly in 2008 after President Barack Obama was elected, reaching a high of 62% in November 2010 and again in 2012 just after he was elected to his second term. Those higher ratings could reflect optimism about Obama's promises to reform healthcare and the passage of the Affordable Care Act. However, since November 2013, shortly after the ACA insurance exchanges first opened, no more than 54% of Americans have rated the quality of healthcare in the U.S. as excellent or good. Americans rate U.S. healthcare coverage far less positively than they do healthcare quality. The percentage of Americans rating U.S. healthcare coverage as excellent or good increased from 26% in 2008 to 38% in 2009. Since then, the percentage who view healthcare coverage in the U.S. positively has varied slightly from year to year, but remains higher than before Obama took office. 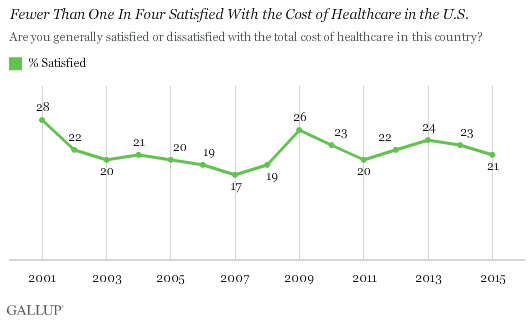 Americans' satisfaction with the total cost of healthcare in the U.S. remains low, with 21% saying they are satisfied. Twenty-eight percent were satisfied in 2001, but satisfaction fell after that, rising again only in 2009, to 26%. This increase too may reflect optimism about the possibilities of Obama's healthcare reform. However, satisfaction has since slipped. Although Americans were more positive about the cost, quality and coverage of U.S. healthcare in the early years of the Obama's first term, that optimism has faded to some degree. Americans' ratings of healthcare coverage are not high, but remain higher than they were in George W. Bush's second term. This may have something to do with the ACA, especially as the U.S. uninsured percentage has dropped since the ACA exchanges opened. The ACA may not have had such obviously positive effects on cost and quality, which Americans generally regard as no better than before Obama took office. At the same time, Americans continue to rate their personal healthcare positively overall, although again without much improvement since the recent healthcare reform took effect.